Are some brands of instant coffee better than others? Comparing two instant coffees - a cheap one and an expensive one. 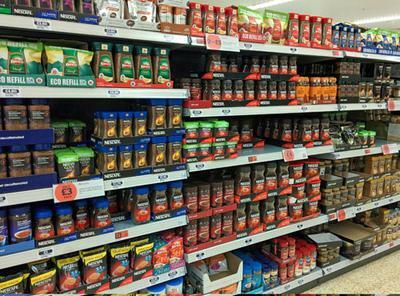 The selection of instant coffees in a UK supermarket. My father-in-law is coming to visit from the UK and I have been warned that he likes instant coffee. Yikes! Now I have to buy some instant, and I have no idea which brands are best, or if there is even such a thing as a brand of instant coffee that is better than the others. I know this site isn’t about instant coffee, but am hoping you can help. Well, you’re right about one thing. I’m no expert on instant coffees! But, as it happens, I’m originally from the UK and I remember my own father drinking instant coffee every day of his life. Here is North America we’re pretty averse to instant coffee, but it’s still very popular in many parts of the world and is a $31 billion industry. In the UK it has a bigger slice of the market than gourmet coffee. As for whether all instant coffees taste the same, I don’t know. Or rather, I didn’t know until your request inspired me to go out and try some. I have added a couple of pictures above. One is of a shelf of instant coffees in a UK supermarket, taken for me by a friend. As you can see, there are a lot of different choices. 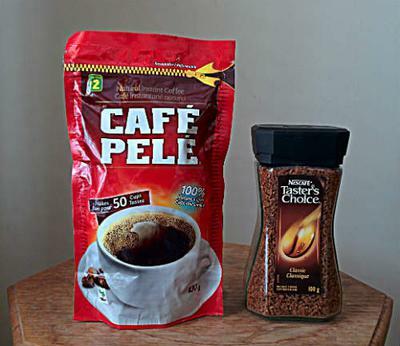 The other photos is the one I took of a super-cheap instant coffee – Café Pele, and a more upmarket brand, Nescafe Taster’s Choice. Yes Bruce – just for you – I conducted an instant coffee taste test! The Café Pele is the cheapest I could find, at a dollar store. Two bucks for 100 grams. The Nescafe cost about $8 for the same weight. The cheap one is so disgusting I spat it out and washed out my mouth with water to get rid of the taste. The Nescafe was a lot better. But still instant and not to be compared with a freshly brewed cup of coffee made from beans. I tried to find some Starbucks Via to include in the taste test, but couldn't find any locally. It’s meant to be really good, but I have tried it before and wasn't impressed. As for your father-in-law, I’d go for the Nescafe. That’s the brand my dad drank, and he loved it. Comments for Are some brands of instant coffee better than others? Everyone has differant tastes. My Uncle swears by Folger's, I on the other hand like Maxwell House. The key is to find the right amount to put in. (Just as with regular brewed coffee). I've tried the StarBucks Via Veranda Blend (Blonde Roast) I made it the way they recommended (8oz water to 1 packet of coffee) and found that it was richer & smoother (But that's to be expected w/a Blond Roast as they are not "Roasting" out most of the caffine from the beans, which also gives it the highest caffine content). I myself would make it with 10-12oz of water next time. I'm not a fan of instant coffee; however, I have indulged in the Starbucks VIA when traveling to remote areas where it's difficult to find a good cup of coffee. If you can find the VIA, it's not horrid. Best of luck whatever you may find!